…from those of you in the marketing business out there. 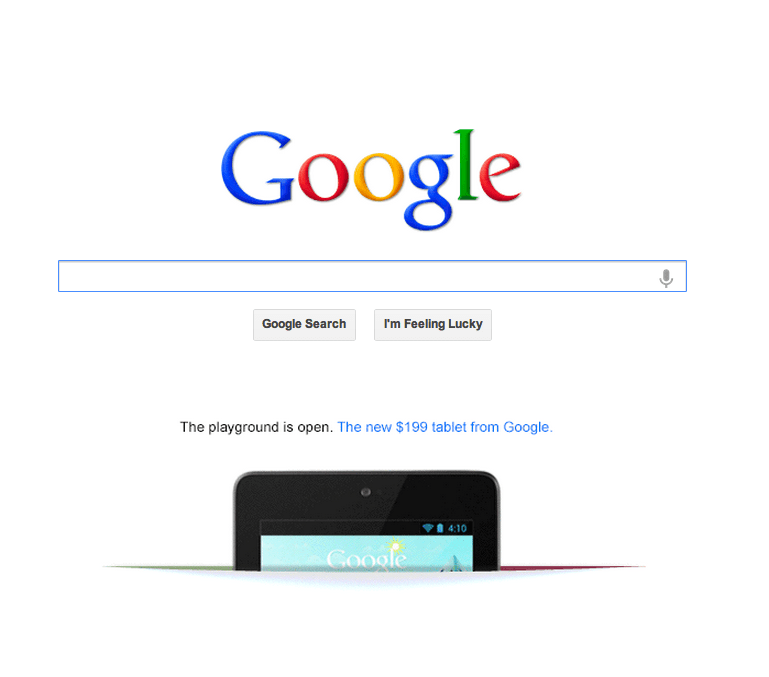 How many of you would love to promote your product on the home page of Google, in this fashion? It’s arguably the web’s most valuable ad placement, it’s not for sale, and no one knows how much traffic or conversion it drives save Google itself. Just one more sign that the Internet Big Five are girding for a massive fight to be the platform for your life. And if you’re shocked, don’t be. Remember when Amazon launched Kindle? The first thing you saw when you went to amazon.com was….what again? But then again, the Kindle was just another product Amazon was selling, right? At least, it seemed that way. Now, when Facebook does a home page takeover with its own hardware device, then the battle will truly be engaged. Though I’m not convinced the young company has that move in it….Regardless, here we go…. True, though it’s hard to imagine this happening on the home page every day, no? My vague prediction after 10 years – if you are a google user you might require a PASSPORT and a VISA to enter Apple, FB or an Amazon ecosystem and vice versa. Doesn’t Facebook already make this available (somewhat) to marketers through Sponsored Newsfeed placements? Since a lot of people are already logged in to Facebook and don’t have to search for the content Facebook provides, paying to guarantee an “ad” makes it into the Newsfeed (the service’s equivalent of Google.com) is relatively simple. I only bring this up because right after I read your post, I went to Facebook and a sponsored Walmart post was at the top of my feed. But to your original point, I agree that getting placement on Google.com would be a marketer’s dream. You can’t take over the whole page on Facebook. That’d be a marketer’s dream, though over time it’d MySpace the place. I’m sad that the home page is now about commerce. It’s all about owning YOU. Yep – sell the platform that sells your services. Is it the most valuable placement? Wonder how many people go to google.com to search vs. search from the browser bar directly. I guess that’s a prime location but I only search from my browser toolbar or a mobile app. Very rarely do I ever search from the homepage of a search engine; the thought doesn’t even cross my mind. With Privacy as Its Shield, Facebook Hopes To Conquer the Entire Internet. Our Data Governance Is Broken. Let's Reinvent It.